This is an aerial view of the Pultney Bridge the main bridge across the River Avon. This bridge has shops lining either side, so that you hardly know when you're crossing it that you're on a bridge. Its the only bride left in Europe of its kind. It was built in the 1700's. The shops on the bridge are about the size of a bathroom. Another shot of the Pultney Bridge. 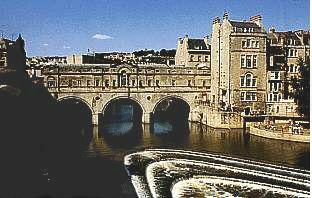 Much of Bath is made from Bath Stone, quarried from the surrounding hills. This stone is very unique in color. If you look carefully at the picture, you'll see that the windows are painted over. At some point in the past (I forget when it was), the city charged a tax on the number of windows a house had. Many people painted their windows over to avoid paying the tax. 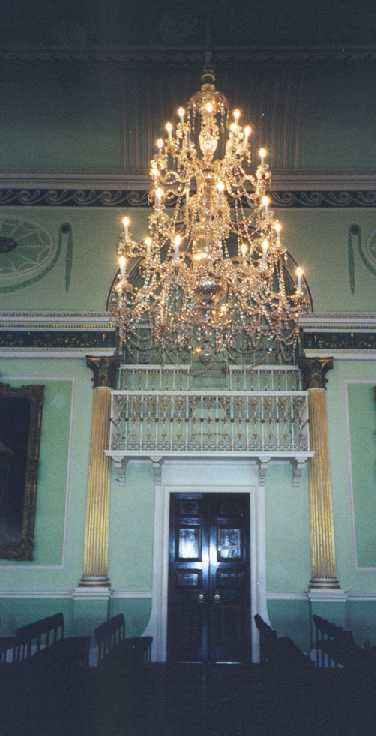 In the Bath city hall there were several fine artifacts, including this chandelier. This is Sally Lunn's house. It was here in 1680 that Sally Lunn opened a bakery, one that is still in operation today. 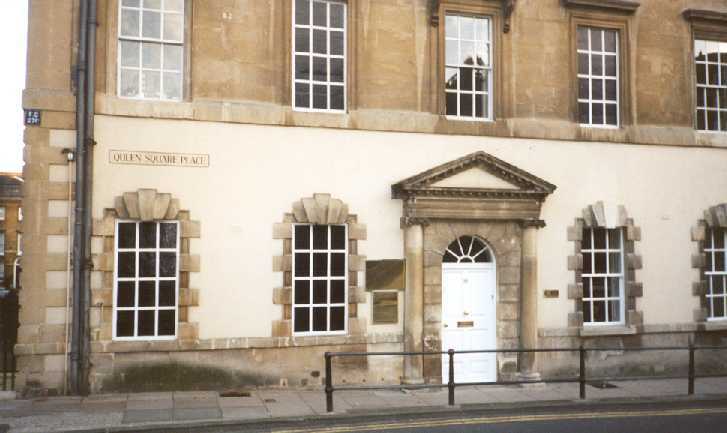 It is the oldest standing building in Bath. The current structure was built about 1480 and the cellar shows traces of Saxon, Roman and Medieval ruins incorporated into the structure. 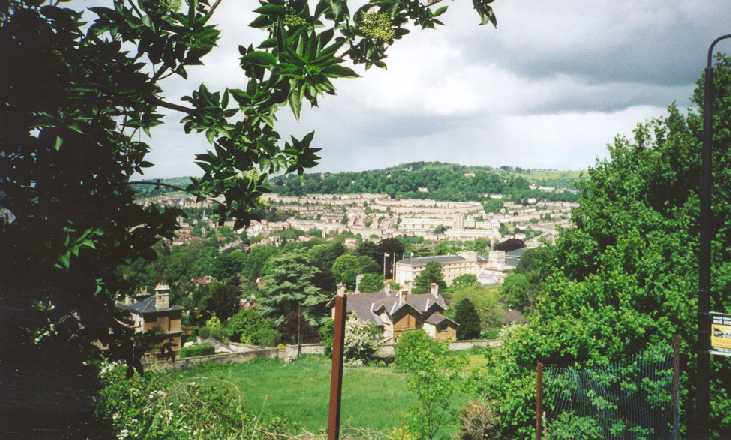 This a picture of Bath as seen from the hills surrounding the town. 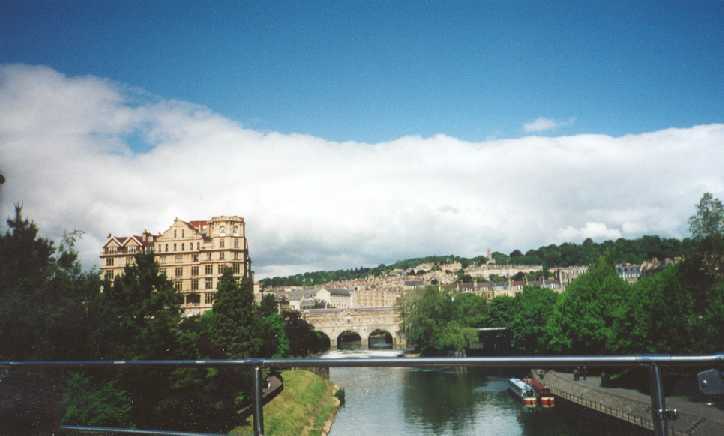 Bath is built almost entirely out of local rock, giving most of the buildings in town the off white look that is seen here.